The Anatolian Journal of Emergency Medicine is the official scientific publication of the Emergency Medicine Association of Turkey (EMAT). The journal is published four times a year, in March, June, September and December. 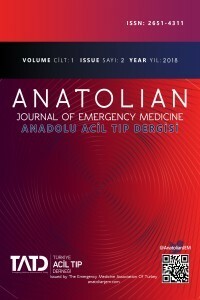 The Anatolian Journal of Emergency Medicine (Anatolian J Emerg Med) (ISSN: 2651-4311) is a peer-reviewed, open-access journal that publishes clinical and experimental trials, case reports & series, invited reviews, letters to the Editors in all fields of Emergency Medicine. The Journal is based on independent and unbiased double-blinded peer-reviewed principles. Only unpublished papers that are not under review for publication elsewhere can be submitted. The authors are responsible for the scientific content of the material to be published. The Anatolian Journal of Emergency Medicine reserves the right to request any research materials on which the paper is based. The official languages of the Anatolian Journal of Emergency Medicine are Turkish and English.